CHEF JAMES: Why did you decide to pursue a career with food? Can you tell us where your interest in the field began and a little bit about how your career has unfolded? CHEF FRANKLIN BECKER: When I was younger, my mother was sick. My father had to cook and it wasn't very good. I began out of necessity. As I got older, I took a job as a busboy in a local Italian restaurant. The job quickly morphed into a position in the kitchen doing prep work. I loved it. I could not wait to go to work everyday. I continued working at various local restaurants throughout college and decided to pursue a career midway through my junior year. At the end of my senior year, I enrolled in the Culinary Institute of America. Now of course, I could not think of doing anything else. I am most comfortable in the kitchen. It is my home away from home. CHEF JAMES: What do you enjoy most about your work? What are your greatest stresses? Your greatest joys? CHEF FRANKLIN BECKER: Making others happy with a good meal is most important to me. It does not matter how or what they eat, just that they are happy. My greatest stresses surround profitability. It is always a juggling act in any restaurant to keep profits high and costs low. We do an excellent job controlling our numbers, but profitability can always be better. My greatest joy is when I see a "student of mine graduate" and use the knowledge I gave them to succeed elsewhere. CHEF JAMES: Do you have any comments on the use of real cork, plastic cork or screw caps on wine? Will most quality wines have screw caps in 25 years? CHEF FRANKLIN BECKER: Cork trees are scarce. If the wine is not compromised, then I think it is fine. Image wise, it is not great, but in do time that feeling will pass. CHEF JAMES: Are Americans in general feeling more comfortable when ordering wines at a restaurant? Are we becoming more confident or adventurous when ordering wine or beer to go with our meals? CHEF FRANKLIN BECKER: We are definitely more knowledgable. We know more and therefore order more than ever before. I don't know if we are more adventurous though. CHEF JAMES: Do culinary schools devote enough time to beverage education (wine, beer, coffee and tea)? CHEF FRANKLIN BECKER: Yes, they did at the Culinary Institute of America. CHEF JAMES: Do you have any strong feelings on whether it is better to get a culinary education first, or is learning 'on the job' still a viable career path for aspiring chefs? What advice would you give to someone in high school who would like to pursue a culinary career? CHEF FRANKLIN BECKER: I think that everyone needs to know what the business is really about before pursuing a career. It is hard work and only a few make it to the top of the field. CHEF JAMES: What are some of the qualities that you feel a successful chef should have? 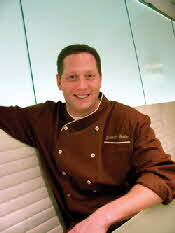 CHEF FRANKLIN BECKER: Patience, good work ethic and good listening skills are very important. We can train a palate, but we can not teach work ethic. That you have or you don't. CHEF JAMES: What 3 cookbooks or culinary books would you pick to save in a time capsule to be opened 500 years from now? CHEF FRANKLIN BECKER: French Laundry by Thomas Keller, Essential Cuisine by Michel Bras and Fish and Shellfish by James Peterson. CHEF JAMES: If you were stranded on a desert island for a year surviving on coconuts and seaweed, what would be the first meal you would like to eat after you were rescued? The first beverage? CHEF FRANKLIN BECKER: A simple iced tea and a slice of pizza from Di Fara's in Brooklyn. Born and bred in Brooklyn, Franklin Becker was formerly the executive chef of Manhattan-based Local, Capitale, and Trinity (at the Tribeca Grand) restaurants and also served as a private toque for Revlon mogul Ronald Perelman. He also was an executive chef for Philadelphia restaurateur Stephen Starr of Starr Restaurant Organization, where he received critical acclaim at Washington Square. Today as Brasserie’s executive chef, Chef Becker demonstrates his bold use of flavor and intelligently applied modern touches, which lend an unexpected taste to the restaurant’s classic French brasserie fare. In 1997, at the age of 27, Becker was diagnosed with type II diabetes. He is the author of The Diabetic Chef, and a regular contribute to dLife, the first national television talk show created exclusively for people with diabetes. A mere mention of Brasserie evokes a fascinating tableau of New York’s elite, mingling into the wee hours of the night. A favorite since 1959, today Brasserie is a redefined legend. With its ultramodern design, this genuine New York icon presents alluring French fare for the city’s chicest events. From corporate power lunches to late night cocktail parties, Brasserie provides a sophisticated, cool backdrop for your next event, conveniently located in Midtown Manhattan.